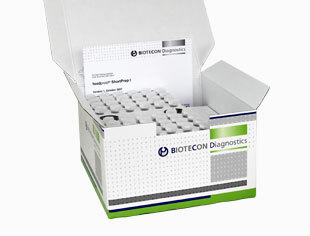 For use with our PCR rapid detection systems, BIOTECON Diagnostics has developed fast and easy-to-use DNA extraction kits. The foodproof® ShortPrep, StarPrep, Sample Preparation and Magnetic Preparation Kits conveniently assist you in efficiently working with all types of sample matrices, including difficult complex samples. The ShortPrep I Kit is designed for quick and easy DNA extraction (using heat-induced lysis) from food enrichments of Gram-negative bacteria, including Salmonella. Cells are lysed using the foodproof ShortPrep I Kit lysis buffer in an incubation step. After centrifugation, the DNA is in the supernatant and ready to use.